Benzie County is always filled with surprises. Up the dirt end of Fewins Road, over a small bridge, and nestled among 50 acres of woodland seems an unlikely place to find a barn full of shoes. More than 5,000 pairs of shoes. Entering the barn is a “wow” moment. There are roughly 3,500 shoes for women (all sizes), 1,500 to 2,000 pairs for children, and the rest are men’s shoes or boots. None of these shoes have ever been worn — most have never even been tried on — and the condition of each pair varies from perfect to nearly perfect. A visit to the barn is a historical trip to another era. The owners of “a Vintage Sole” are Jim and Carol Brouwer, who have been married for 35 years and now reside in rural Inland Township, just past the fish hatchery. It really comes as no surprise that Jim got into the shoe business — his great-grandfather owned R. Brouwer’s City Boot & Shoe Store in Grand Haven, Michigan, which led to his grandfather’s S.J. Brouwer’s Shoe Company, a spinoff in Wauwatosa (“land of the fireflies”), Wisconsin. Carol, who remembers buying shoes from Jim’s family store, is an Albion graduate whose grandfather was one of the founders of Crystal Lake’s Congregational Summer Assembly, now commonly known as the CSA (“though in those days, it was called the Assembly,” says Carol). 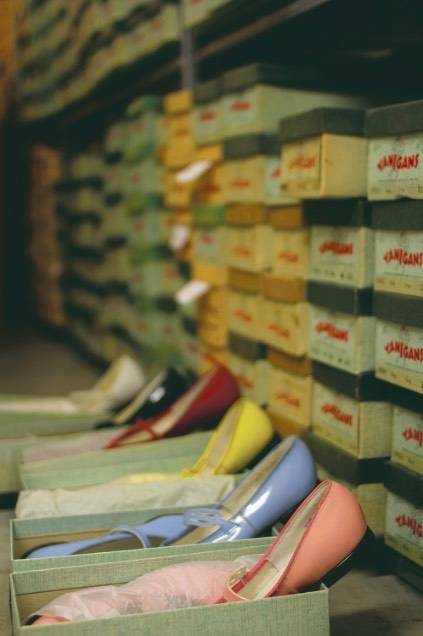 An array of vintage shoes that are in mint condition. Most of the 5,000 pairs have never even been tried on. Photo by Aubrey Ann Parker. As Jim wooed Carol, she wooed him into loving Benzie County. In 2005, they moved here full-time. They had purchased Gwen Frostic’s cottage in the CSA, but it was not habitable for winters, so they eventually bought the house on Fewins Road. Jim was not ready to retire, and the two searched the area to find a storefront to purchase. Instead, they bought nearly the entire inventory from the basement of a traditional family shoe store. They loaded thousands of shoes — all discontinued styles but brand-new (even though they were old) — into a truck. After several trips, they finally unloaded the shoes into their barn where the boxes are now neatly stacked and sorted by brand, then style, size, and width. There are generally between one and three of everything. There are shoes from the 1940s all the way to the 1970s, but they did not take anything past the early ’70s, when “shoes got ugly,” according to Carol. Boots (think “Go-Go”) are the biggest sellers of the inventory. Initially the Brouwers’ daughter Libby — an Interlochen graduate and now a fifth-generation shoe retailer — looked about the treasure trove and took 12 pairs of heels to the Fashion Institute of Design and Merchandising (FIDM) in Los Angeles to “test” on her friends and fellow students. She was overwhelmed by the enthusiasm and compliments, especially over the 1940s black suede heels. Libby’s education in Art History, Fine Arts, and Fashion fused into the formation of the business. The sales are mostly online, but the Brouwers also love having people over to shop around in the barn. 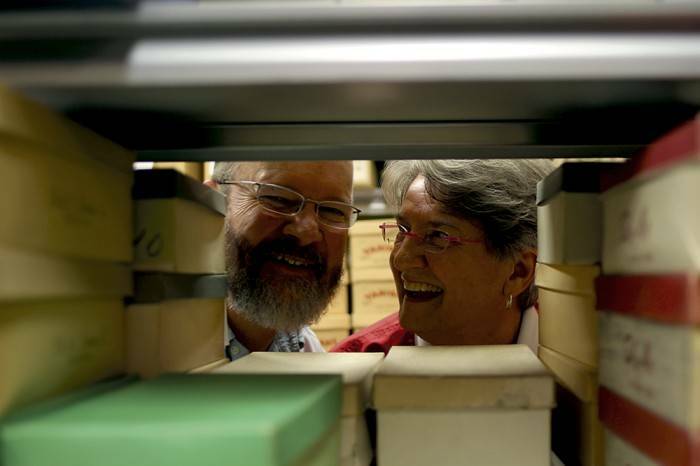 Carol and Jim are a gregarious couple who will regale you with many delightful stories, about shoes and otherwise. Visitors will be amazed at how many stories there are about shoes — as a fundamental necessity and also a fashion statement. For example, Jim told us that the wedge, a popular style today, was invented during World War II because the need for metal (for war materials) was so intense that shoe manufacturers were forbidden to use any metal in high heels, hence the call for a new style of shoe. Who is the vintage client? All over the board, apparently — young, old, grandmas, teens, and tweens. The Brouwers have also sent shoes to clients in Australia (for a costume designer) and Norway (for a play that was set during World War II), the United Kingdom, Canada, Germany, and Israel. Almost all of these shoes are stamped “Made in the USA,” with a small percentage having been manufactured in Brazil, where tanneries began to flourish after they began to lose support in the States. The quality of these shoes is far superior to what we have become accustomed to in modern days. We all know how difficult it can be to find a shoe that fits all over, not just in length. In the first half of the 20th century, American shoe manufacturers used a “combination last” to create their product. A last is a block or form, shaped like a person’s foot, on which shoes are made or repaired. A combination last would mean that a shoe might be shaped narrower in the heel, with a regular size for the width, or vice versa. Most of the shoes fabricated at that time also had a cushioned heel. All of the boxes have the original prices marked on them. One interesting style, the “Willow Tarsal Traveler,” was originally $6.95 and is now priced at $128. Most of the shoes cost between $28 and $248, depending on era and style. The brand and style names are fun and varied, such as: Cheer Leaders, Western Maid, Charm Step, Janigans, and Missy Mates (brands) or Yeh-Yehs and Tiffany boxes, named after the famous Audrey Hepburn film (styles). Some promotional slogans were even funnier, for example, Hush Puppies “quiet your barking dogs,” or wearing Red Goose is “half the fun of having feet.” You know the footies that are given out during overseas flights? The ’40s footies were made of leather — with a leather container, no less — and were made primarily for use on long train rides. Classy! Other fun finds include the Boy Scout “official” boot, a ’50s boot with a wool lining, fabulous rabbit-fur-lined galoshes that are made to go over high heels (for those of you too young to remember — an overshoe for cold and wet weather that is especially high, warmly lined, and made of fabric and rubber). Perfect for staying warm and chic during a cold Benzie winter like the one that we just endured. Are you ready? The barn of “a Vintage Sole” is easy to find. Give the Brouwers a call at 231-275-1525 or email them for directions: contact@avintagesole.com.